From an accessory standpoint, I’m a bit of a minimalist. I don’t have a case on my iPhone or iPad and prefer to carry as few items in my tech bag as possible. The less I have to schlep around the better. And when I’m looking to add new items to my setup, I have a high barrier to entry — the product has to be well-made and provide incredible utility before it finds a permanent home in my kit. For years, my iPad stand of choice was the Compass by Twelve South. A simple, foldable stand made out of heavy gauge steel with rubber feet. It can hold most iPads in portrait or landscape, at two different angles, without too much wobble when tapping the top corners of the screen. The Compass is a great product, but Twelve South released an updated version — the Compass 2 — a few years ago, which is a major regression. The feet sit much closer together compared to the original Compass and, as a result, it offers far less stability when tapping on the edges of the screen. If you can still find an original Compass, I highly recommend it. I bought the Compass when it first become available — during the original iPad era. But last year it was beginning to show signs of its age with relatively loose hinges and one foot that swung further open than the other, which had my iPad sitting a bit askew. It worked, but I thought I was better off buying a new one before it became unusable and while Amazon still had them available. The Compass was an important accessory for me. Whenever I would type a feature article, my iPad Air 2 would be propped-up in the Compass with my Bluetooth keyboard on the desk in front of it. I’ve typed tens of thousands of words with that setup and the thought of having to find a new stand was a bit unnerving — there’s very few iPad stands on the market that collapse into such a small package and still offer great stability for your device. But earlier this year, in an effort to transition all of my accessories to Lightning-powered variants, I retired my old, AA-powered Apple Bluetooth Keyboard and purchased a Magic Keyboard. It took some getting used to, especially the odd arrow key configuration, but I’ve grown to love it. The keys produce a satisfying sound while typing and the slim profile allows it to easily slip into a small bag. After a few months with the keyboard, I realized that my iPad habits were changing. 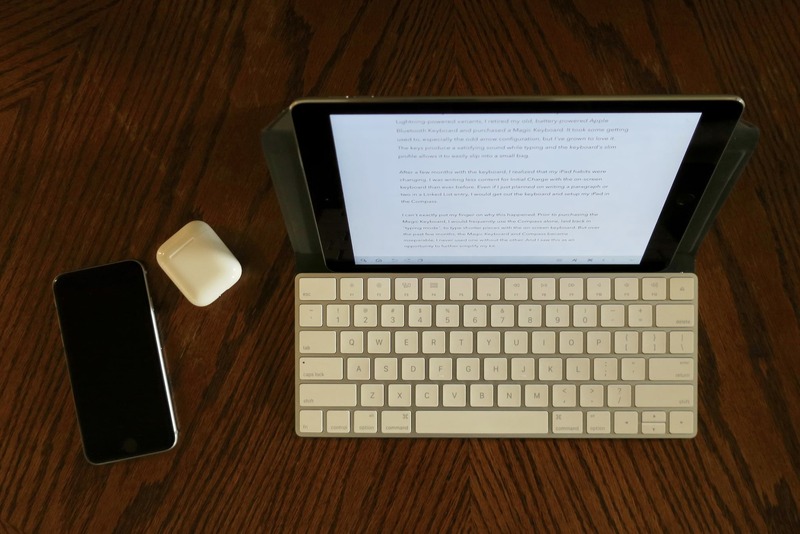 I was writing less content for Initial Charge with the on-screen keyboard than ever before. Even if I just planned on writing a paragraph or two in a Linked List entry, I would get out the keyboard and setup my iPad in the Compass. I can’t exactly put my finger on why this happened. Prior to purchasing the Magic Keyboard, I would frequently use the Compass alone, laid back in “typing mode”, to write shorter pieces with the on-screen keyboard. But over the past few months, the Magic Keyboard and Compass became inseparable, I never used one without the other. And I saw this as an opportunity to further simplify my kit. Studio Neat’s Canopy seemed like the perfect addition to my setup. 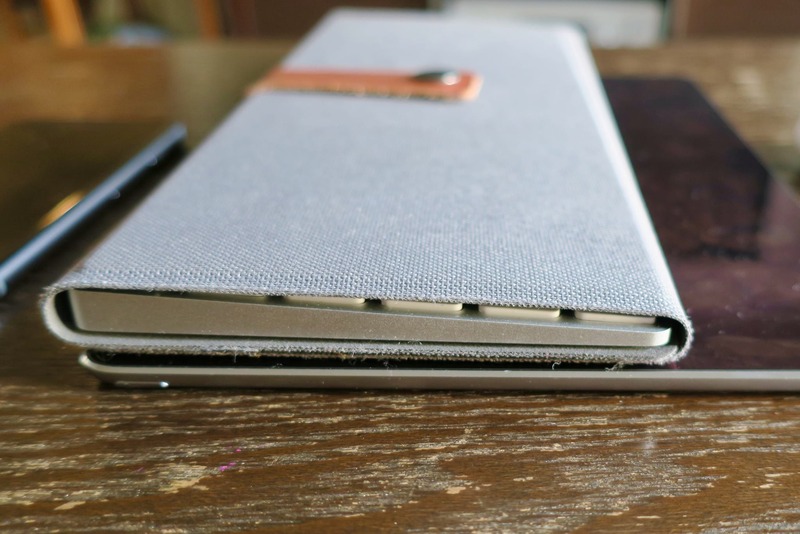 The Canopy is a slim Magic Keyboard case that folds out into a stand for the iPad. It offers the functionality I need from the Compass without the increased volume in my bag — it only adds a few millimeters to each side of the Magic Keyboard. I was first made aware of the Canopy when John Voorhees wrote about it on MacStories. It looked like a great product, which is what I would expect given Studio Neat’s reputation. With the idea of simplifying my setup in mind, I ordered the Canopy about a month ago and have used it on a near-daily-basis since it arrived. My first surprise upon receiving the Canopy was that it attaches to the Magic Keyboard using “micro-suction pads”. Perhaps I should have read the product page a little more thoroughly, but for some reason I assumed the keyboard was attached in such a way that I could remove it more easily. With these micro-suction pads, there’s a finite number of times your keyboard can be detached. With each removal, the suction pads’ stickiness weakens. When I first placed my keyboard inside the Canopy, it was a bit off-center and it took a few tries to get it right. Even with just a few removals, I could notice the degradation of stickiness. And because of that, you’ll probably want your Magic Keyboard to just live inside the Canopy. Update 7/30/2017: Matt Gemmell offered a correction on Twitter — apparently the micro-suction pads don’t have a finite number of attachment cycles. They’re made out of tiny suction cups which can be cleaned with sticky tape. Having your Magic Keyboard permanently placed inside the Canopy means that it probably isn’t a great fit for anyone that uses the same keyboard on their iPad as they do on their Mac. You could certainly lay the Canopy flat when your keyboard is paired with a Mac, but you’d need a fair bit of desk space between your keyboard and display, which might not be practical for some users. One concern I had before using it myself was the way the iPad sat up against the top edge of the keyboard — the Canopy doesn’t offer any material to act as a buffer between the two. There’s the possibility that the keyboard’s aluminum housing could scratch the iPad, but I haven’t had any blemishes develop yet. In the four weeks that I’ve had the Canopy, it has held up quite well. I’ve noticed some minor fraying develop on the front edge from opening and closing, but overall, the whole thing feels solid. The material is rigid enough to hold your iPad without any wobble from screen taps and the snap mechanism that keeps the stand upright, while in use, and holds it closed, while it’s folded up, feels like it could withstand years of abuse. The fraying would be concerning, but I don’t expect it to snowball into something that renders the Canopy unusable. Studio Neat’s Canopy is perfect for iPad-only (or iPad-mostly) users who enjoy typing on the Magic Keyboard and prefer to use their iPad without a case. 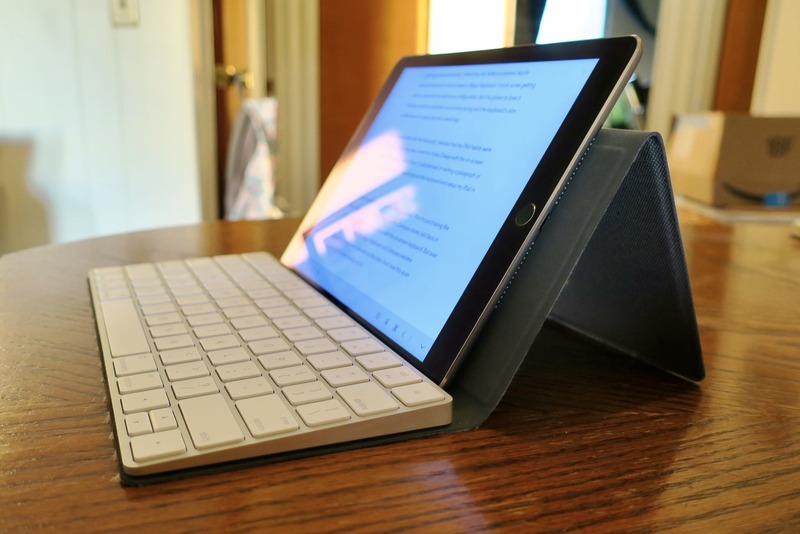 Which isn’t to say that you couldn’t use the Canopy alongside an iPad case — there’s certainly enough room to — but it’s refreshing to find a product that’s designed to help you add a physical keyboard to your iPad that doesn’t also attach to your iPad. The Canopy gives you much of the benefits of an iPad keyboard case without having to actually use an iPad keyboard case — most of which are ugly and miserable to use. The Canopy stands out from the keyboard accessory crowd because it combines sturdy materials and a brilliant aesthetic with a keyboard that feels good to type on. It folds up quickly to throw in a bag and sets up easily to reduce friction between you and your work. It’s the kind of accessory that doesn’t get in your way while your using it, but reminds you of how well-built and handsome it is every time you set it up or snap it closed. At $40, the Canopy might seem like an expensive product, especially since you have to purchase the keyboard separately. But I think it offers enough utility in such a slim package that it’s more than worth the cost. If you’re looking for an iPad typing solution that doesn’t add much bulk to your bag, the Canopy is a great solution.